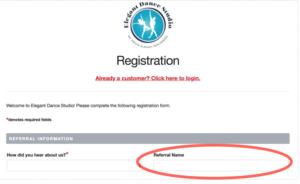 Elegant Dance Studio wants to thank you for registering and for the trust you have placed in us! We wanted to find an appropriate way to say “Thank You” and we hope this referral program does just that! There is no limit to the number of referrals you may get! Just think of the possibilities; if you organize your own “referral group,” all of your lessons could possibly be FREE! But that’s not all, when you reach 8 referrals, you also earn an additional $20 bonus credit. There is no limit to the number of referrals you may get! What an easy way to earn huge discounts and share the good times and memories with your friends! What could be more easy and fun? Referred family must be new to Elegant Dance Studio and not previously a part of our school. The referral program is per family and is not applicable to siblings of past, current or referred students. Credit is only issued to a family’s account not to each individual student within the family.